Each year, Media Specialists select 15 of the newest titles by American authors to be the current year's Sunshine State Readers books. These novels cover all genres--fantasy, historic fiction, action, and more -- and have been chosen for their particular appeal for students in grades 6-8. 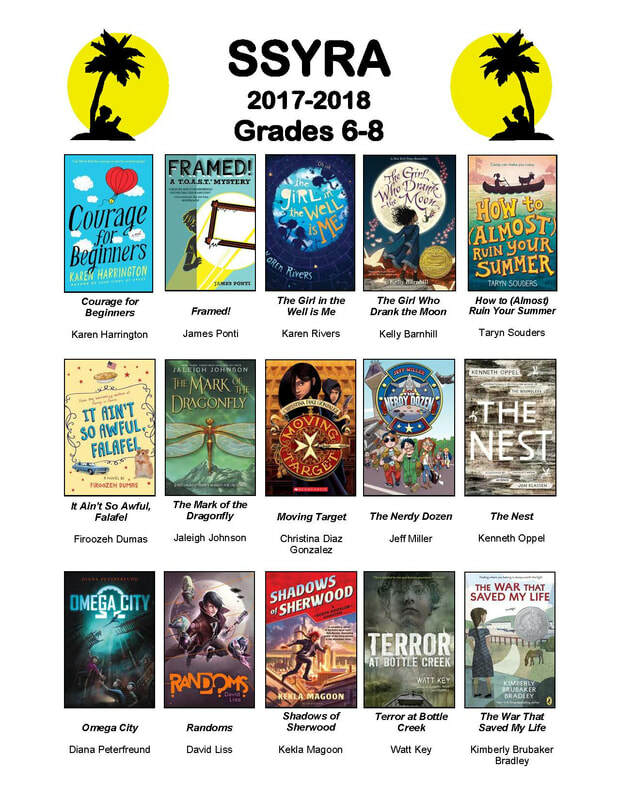 Check out the 2017-2018 titles for grades 6-8 here. This link provides an annotated list (includes brief plot summary). Cover images of titles appear below. Students at BRMS are encouraged to join our Sunshine State Readers Group, and will earn prizes and rewards for reading 4 or more of this year's titles. At year-end, we have a party with trivia games, food, and even live sessions with authors! Stop by the Media Center to sign up and get your Edmodo code to log in online and chat about the books. We have multiple copies of each book in the media center.